This Discover Cooking with California Olive Oil Recipe Contest submission comes from Caroline Brody. 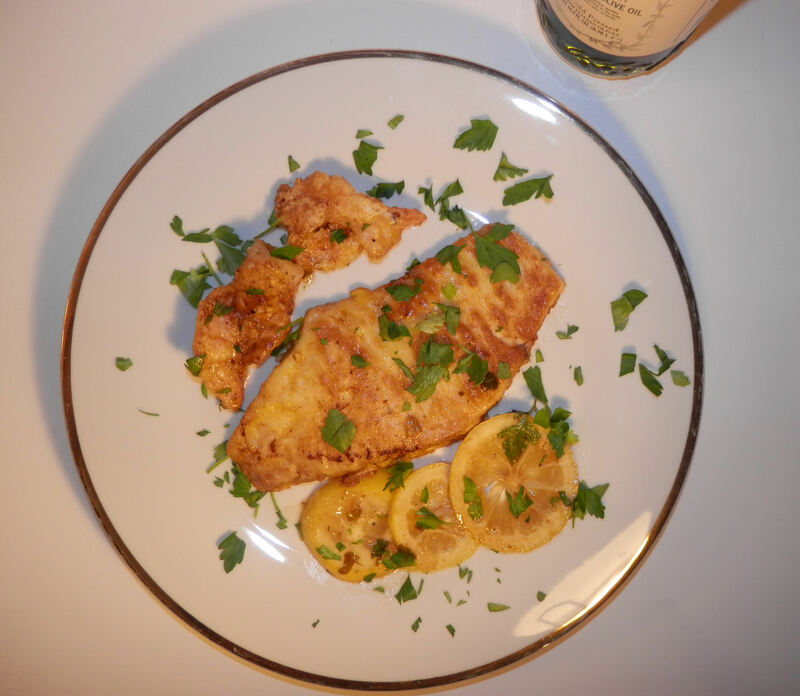 Her recipe for filet of sole creates a light, delicate and tender, sole and shrimp dish in a creamy, lemon butter olive oil sauce with garlic. 1. Start by preheating your oven to 300 degrees. Prepare a large skillet over medium heat, add 3 tbsp. of the oil and 3 tbsp. of the butter. Heat until foaming. 2. Pour your flour in a shallow dish or deep enough bowl. Whisk two eggs in a medium-size bowl. Dredge the fillets in the flour, make sure you coat both sides and then dip the fish in the eggs, and make sure it’s evenly covered. Repeat with all of the fillets and add to your skillet. Cook each side for 4-8 minutes; you want the bottom of the filet to get lightly browned before you flip them. Transfer the fillets to a baking sheet and place them in the oven to stay warm. 3. Repeat the same exact process with the shrimp. The shrimp, however, will cook very quickly, around 1-3 minutes each side. Transfer to the same baking sheet with the fish. Once you are done with all of the fish, add the remaining oil and butter and garlic to the skillet. Wait for the butter to foam and add the sliced lemons. Cook for 2 minutes. Add the lemon juice, wine and bring to a boil, cook until somewhat reduced. Add the vegetable stock; bring to a boil until the sauce is slightly thickened. Sprinkle in the parsley, salt, and pepper. Reduce the heat to low and add the fish and shrimp to the skillet. Serve immediately. Buon Appetito!! What an awesome recipe!! Wish I could give you 10 stars!!! This sounds absolutely ridiculously delicious!!! YUM!